This website is based on the archives of Gloucestershire Police and has been created by the Gloucestershire Police Archive Volunteers as part of “For the Record”, a Heritage Lottery Funded project. Here you can browse through photos, memories, stories and historical information related to the history of Gloucestershire Constabulary. 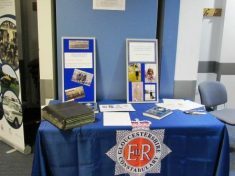 Gloucestershire Constabulary Archive Group was formed in 1998 and first became involved with the county’s police heritage when a number of retired police officers were asked to record details of some photograph albums which had been discovered on police premises. The project and the group has evolved to include members of the wider police family as well as people interested in police history. A database of archive material and images has been created containing almost 8,000 entries- with many more waiting to be added. this work has led to the Constabulary and the Police and Crime Commissioner working in partnership with Gloucestershire County Council in the “For The Record” Project. the Project will enable the Constabulary Archive records to be preserved in the best condition for years to come making the Constabulary records truly accessible to the public and other interested parties. It has also seen the creation of the Heritage Hub where a number of different archive volunteer groups will be housed creating a fully interactive hub. 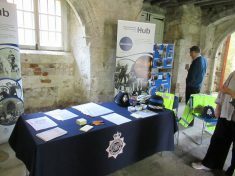 We also stage exhibitions at Constabulary open days and local history & heritage events, and answer enquiries about police ancestors and history. We are always interested in new recruits, so if you’re interested please contact us. 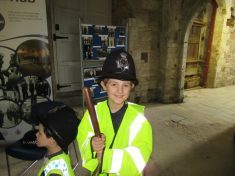 You may also find further information at the Tetbury Police Museum as they hold some of the Gloucestershire Police archives. The Victorian Police Station and Courthouse house the Town Council’s administration offices, with the original Police office and cells containing a most interesting and not to be missed array of exhibits and memorabilia primarily dedicated to the history of the Gloucestershire Constabulary and also the social history of Tetbury. The museum which is well worth a visit as it includes the world renowned Alex Nichols collection of Handcuffs and Restraints, and on the first floor a complete magistrates court with a display using models and depicting a hearing, as it would have been in the late 1940’s or early 1950’s. Visitors can also enjoy other audio-visual displays, children’s quizzes and a trail. This is a great site – a very useful find! I am researching, for a history research group, James Simpson b. 1856. You have a fantastic photo of him as Officer number 47. In the joining lists however, No 47 is given to another person – did they re-use the numbers? Thank you for your comment. Collar numbers were reused until relatively recently, in fact there were times when an officer left on one day and the next day the number was reissued. This is a wonderful site and will, no doubt, be used by many. Your interest in forming the records is commendable. Thank you all. Thank you for your time and effort in bringing this to be seen. Although it gives me facts I already know via word and mouth it is nice to see something in print. Mike Boulton. Formally PC670. Was stationed at Filton,Cheltenham,Tewkesbury, Lydney and Staple Hill. Really fantastic work. Great people and an amazing collection of pictures to make us proud of our ‘family force’.